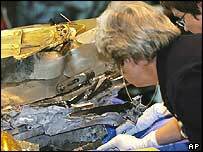 Scientists have retrieved the damaged science canister from the Genesis mission and taken it to a clean room at the US Army base where it crashed. 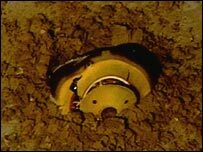 A team of specialists plucked pieces of dirt and mud that had lodged in the canister after it smashed at high speed into the Utah desert. The Nasa Genesis team says it will begin examining the contents of the capsule later on Thursday. Scientists are hopeful they can recover some of its solar wind samples. The precise nature of these particles, collected in space on delicate wafers, could tell scientists how the Sun and the planets grew out of a huge cloud of gas and dust 4.5 billion years ago. Spacecraft engineers are encouraged that the sample canister was not more badly damaged than it was after the 310km/h (193 mph) impact with the Utah salt flats. "We have the capsule," said Genesis project manager Don Sweetnam, of the US space agency's (Nasa) Jet Propulsion Laboratory in California. "It is on the ground. We have previously written procedures and tools at our disposal for such an event." After the crash, the Genesis ground crew landed close to the impact site to document the area. "For the velocity of the impact, I thought there was surprisingly little damage," said Roy Haggard of Vertigo Inc, who was one of the first on the scene. 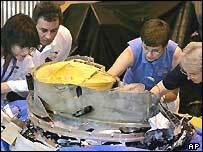 "I observed the capsule penetrated in the soil to about 50% of its diameter. "The shell had been breached about three inches and I could see the science canister inside and that also appeared to have a small breach," he said. Colin Pillinger, of the UK's Open University, which was to have analysed some of the Genesis samples, said the situation looked grave because the samples might have been contaminated. "There could be fragments inside there that still contained some kind of scientific information," he said. "But the contamination from the desert is going to be a killer at the end of the day for the scientists." His OU colleague Ian Franchi feared the wafers used to collect the solar wind particles would have been smashed, making it difficult for pristine samples to be recovered. "Picking out the fragments that we want is the problem because there are many different types of fragment; and different types of material from different parts of the solar wind," he added. Roger Williams, of the Los Alamos National Laboratory in California, said he believed some of the sample collection wafers were still intact. "As far as I understand some of the wafers are OK so we do have some samples to analyse," he told reporters. "There is some concern about contamination but we are out on the salt flats which are dry, so we hope it will not be too much of a problem. We are going to make the best of it." Nasa's Administrator Sean O'Keefe said of the mishap: "We're encouraged by the news out of Utah, despite the hard impact landing of the Genesis Sample Return capsule. "The spacecraft was designed in a way to give us the best chance at salvaging the valuable science payload should we suffer a landing like the one we witnessed today. "Exploration of the heavens is not an easy task. Our ability to travel throughout our Solar System is limited, whether by human-tended or robotic craft. "Genesis was an experiment to journey far from home and return with new clues and possible answers to some of the fundamental questions regarding the origin of our Universe." The $264m Genesis mission was launched in August 2001 on a journey to capture samples from the storehouse of 99% of all the material in our Solar System - the Sun. It used collectors made of ultra-pure wafers of gold, sapphire, silicon and diamond. These were hung outside the probe for more than 800 days, sifting space for just 10-20 micrograms of solar wind material, and were designed to be returned for analysis. "Shock and disbelief among the scores of waiting scientists"